Two of Turkey's domestically-developed HÜRKUŞ-B training aircraft, which completed serial production and flight tests, began being used for pilot training by Turkish Air Forces at western Izmir province's Çiğli Base on Friday. The aircraft – which was designed and upgraded by Turkish Aerospace Industries (TAI) and inducted in Turkish Air Force's inventory in 2018 – is more stable and comprehensive than the previous version, HÜRKUŞ-A. 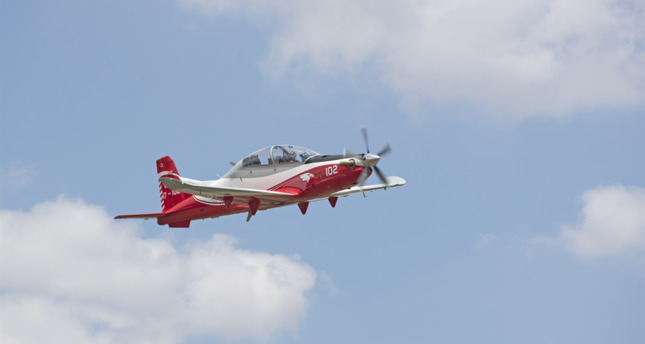 Pilots are reportedly receiving training in test flights with the adapted aircraft from HÜRKUŞ pilot Murat Özpala. HÜRKUŞ-B will be used to train pilots with its many features, including night flight, formation flight, instrument flight, visual flight and aerobatics cross-country flight. The new aircraft will be subjected to various assessments by Air Force pilots to ensure it meets all the needs of the Air Force. After these tests, improvements related to the aircraft will be finalized in cooperation with the Air Force and TAI. Aircraft deliveries will be carried out systematically, and 15 aircraft will be delivered to the Air Force in the first half of 2019. HÜRKUŞ-B basic training aircraft was developed in accordance with the requirements of Turkish Armed Forces (TSK) over the HÜRKUŞ-A configuration and was equipped with systems similar to those in fighter jets in terms of digital cockpit, pressure booth, ejection seat, oxygen support and landing gear. The aircraft which was designed to be faster, stronger and 100 kilograms lighter than HÜRKUŞ-A and is a pioneering aircraft in its class. The self-protection feature of the armored version of the aircraft, HÜRKUŞ-C armed close air support, was successfully tested last week. HÜRKUŞ-C, which will be equipped with national missiles, will be an important power in close air support in the fight against terrorism.